Olive tree is the symbol of peace and according to Greek tradition its country is Athens and the first ever olive tree was planted at the Acropolis by the goddess Athena. The olive thrives in temperate climates without extreme temperatures and humidity levels (Greece, Spain, Italy, and Turkey). The olive fruit matures in autumn, a period during which the crop occurs. 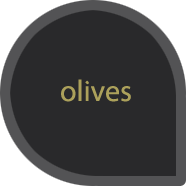 Greece produces many kinds of olive and in large quantities. The Greek olives, an excellent source of monounsaturated fatty acids, and their rich nutrients, benefit our health. They give the human body fiber and minerals and they are also a good source of vitamin E, rich in antioxidants. 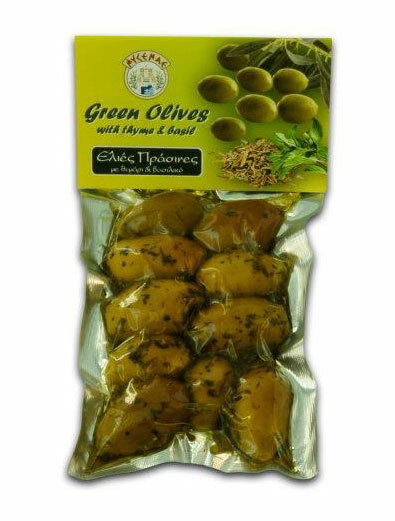 GREEN OLIVES WITH THYME & BASIL 100gr. Tasty green olives marinated with thyme and basil in vacuum. The oil they contain is ideal for pasta with tomato sauces or in salads and steamed vegetables. 100g.